Goals from Charlie Adam and DJ Campbell earned Blackpool an away victory over a disappointing Newcastle. Adam coolly converted from the penalty spot after Luke Varney was needlessly cut down in the box by Alan Smith. Newcastle, who hit the post through Mike Williamson in the first half, improved after the break with Andy Carroll going close late on. But Campbell - a deadline day signing after a loan spell last season - finished from 20 yards to seal the win. The teams went into the match with similar records: four points apiece, one convincing win and a lesson learnt at the hands of one of the "big four". But it was Newcastle who started as strong favourites, with home advantage, a settled team and one of the country's in-form strikers in Carroll. However, the fact that Newcastle were using the same starting 11 as in their previous Premier League games did not stop them from displaying a worrying lack of understanding at times. By way of contrast, Blackpool, who have used 19 players this campaign, settled instantly and almost took the lead inside a minute through the unmarked Campbell, who was off target with an overhead effort. On the rare occasions the ball did come their way, Newcastle forwards Kevin Nolan and Carroll appeared to have the power and nous to concern the away defence. And Blackpool's pressing almost led to a goal on 12 minutes when Joey Barton was woefully careless with a crossfield ball. Running on to the ball, Adam advanced into Newcastle's half and slid a perfectly weighted ball through for Campbell. However, the striker, so prolific with 11 goals from 18 appearances last season, lacked conviction and Harper was able to make a smart save before pouncing on the rebound ahead of Brett Ormerod. While the route through the centre was closed off, Newcastle did at least sporadically threaten down the flanks with Wayne Routledge appearing to have the beating of left-back Stephen Crainey. The former Spurs and Aston Villa winger sent in one cross that Nolan was inches away from connecting with before being hauled down in full flight by David Vaughan - the resultant free-kick headed against the post by Williamson. While Newcastle enjoyed the greater possession in the first half to no real effect, Blackpool remained dangerous on the break and thought they had taken the lead on the half hour only for Campbell's low strike to be ruled out for offside. But from their next break they did silence the Toon faithful. Running at the defence, Campbell fed Varney on the left. In truth, there appeared little danger as the forward stumbled his way into the box, but Smith was rash with a challenge, referee Lee Mason pointed to the spot and Adam did the rest, the goal marked with a show of support for youth coach Gary Parkinson - in hospital following a stroke on Friday. Moments later the half-time whistle was met with boos - Newcastle had to improve and although they did luck was to remain against them. With Blackpool increasingly happy to sit back and rely on ever-more infrequent breaks there was plenty of time on the ball for Barton in midfield. And he almost forced an equaliser on the hour, taking advantage of a lucky deflection to burst into the box only for Matt Gilks to make a superb plunging save to his left. Barton also set up a chance for Williamson, who came painfully close to converting a cross at the far post, while Carroll could also have done better when through to the left of the goal, Gilks proving his worth once more. 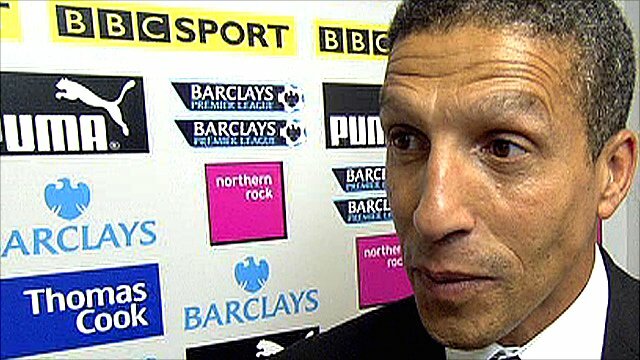 Manager Chris Hughton introduced Hatem Ben Arfa for his debut as Newcastle continued to press, Jose Enrique cutting in well from the left only to fire wastefully high and wide with his right foot. 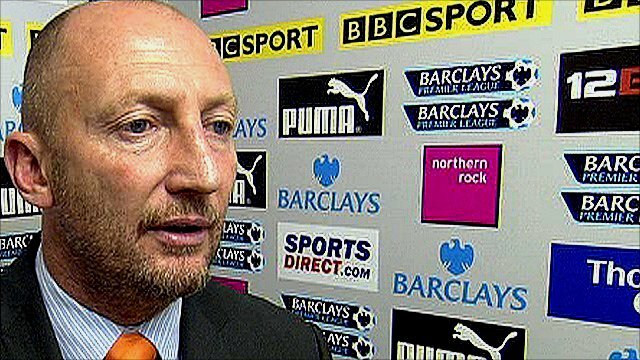 Ian Holloway brought on Keith Southern late on to bolster the defence, yet still Newcastle pressed, Nolan seeing a shot blocked, with Routledge's follow up cleared off the line. But the gilt-edged chance to level appeared to finally arrive on 87 minutes only for Gilks to make the best of a series of superb saves, using his feet to deny Carroll from close range. And there was an air of inevitability as Blackpool launched a late counter, Adam playing in Campbell who superbly fired home left footed from 20 yards to move Blackpool up to fourth place in the table. 90:00+3:56 Free kick awarded for an unfair challenge on Marlon Harewood by Mike Williamson. Ian Evatt takes the direct free kick. 90:00+2:43 Joey Barton concedes a free kick for a foul on David Vaughan. Neal Eardley takes the free kick. 90:00+1:30 Sanchez Jose Enrique produces a cross, Close range effort by Peter Lovenkrands clears the crossbar. 90:00+1:17 Shot by Shola Ameobi. David Vaughan gets a block in. 90:00 Booking Dudley Campbell is cautioned. 89:17 Assist on the goal came from Charlie Adam. 89:17 GOAL - Dudley Campbell:Newcastle 0 - 2 Blackpool Dudley Campbell grabs a goal from just inside the penalty area to the bottom left corner of the goal. Newcastle 0-2 Blackpool. 89:05 Hatem Ben Arfa takes a shot. Ian Evatt gets a block in. 88:49 The ball is swung over by Hatem Ben Arfa, clearance by Ian Evatt. 88:33 The ball is crossed by Peter Lovenkrands, David Vaughan makes a clearance. 87:21 Effort from 12 yards by Andrew Carroll. Save made by Matthew Gilks. 86:15 The referee penalises Dudley Campbell for handball. The free kick is delivered right-footed by Joey Barton from left channel, Ian Evatt makes a clearance. 85:50 The offside flag is raised against David Carney. Steve Harper restarts play with the free kick. 84:51 Andrew Carroll concedes a free kick for a foul on Dekel Keinan. Free kick taken by Matthew Gilks. 83:41 Steve Harper takes the free kick. 83:41 Substitution David Carney joins the action as a substitute, replacing Elliot Grandin. 83:41 Substitution (Blackpool) makes a substitution, with Keith Southern coming on for Luke Varney. 83:41 Luke Varney is ruled offside. 83:15 The ball is crossed by Peter Lovenkrands, clearance made by Neal Eardley. 81:46 The ball is sent over by James Perch, clearance made by Dekel Keinan. 81:30 The ball is sent over by Joey Barton. 80:22 Matthew Gilks takes the free kick. 80:22 Substitution Wayne Routledge goes off and Shola Ameobi comes on. 80:22 Kevin Nolan is flagged offside by the assistant referee. 79:32 Sanchez Jose Enrique crosses the ball. 78:54 The offside flag is raised against Peter Lovenkrands. Matthew Gilks restarts play with the free kick. 78:05 Shot by Kevin Nolan. Ian Evatt gets a block in. Effort from 12 yards by Wayne Routledge. Dekel Keinan gets a block in. 77:03 Peter Lovenkrands takes a shot. Matthew Gilks makes a save. 76:38 Centre by Luke Varney. 76:23 Mike Williamson gives away a free kick for an unfair challenge on Marlon Harewood. Free kick taken by David Vaughan. 75:47 Shot by Sanchez Jose Enrique from deep inside the penalty area misses to the right of the goal. 74:45 Hatem Ben Arfa crosses the ball, save by Matthew Gilks. 74:23 The offside flag is raised against Marlon Harewood. Free kick taken by Kevin Nolan. 74:00 Peter Lovenkrands takes a shot. Save made by Matthew Gilks. 71:46 Charlie Adam produces a cross, Shot by Ian Evatt from deep inside the penalty area misses to the left of the target. 71:46 Substitution Jonas Gutierrez leaves the field to be replaced by Hatem Ben Arfa. 71:46 Booking Fabricio Coloccini booked for unsporting behaviour. 71:32 Free kick awarded for a foul by Fabricio Coloccini on Dudley Campbell. 70:37 Direct free kick taken by Sanchez Jose Enrique. 70:37 Booking Booking for Charlie Adam for unsporting behaviour. 70:30 Free kick awarded for a foul by Charlie Adam on Wayne Routledge. 69:36 Charlie Adam concedes a free kick for a foul on Wayne Routledge. Joey Barton restarts play with the free kick. 69:01 Dekel Keinan fouled by Andrew Carroll, the ref awards a free kick. Matthew Gilks restarts play with the free kick. 68:33 A cross is delivered by Charlie Adam. 67:56 Kevin Nolan has an effort at goal from 20 yards. Save by Matthew Gilks. 66:38 Wayne Routledge concedes a free kick for a foul on Charlie Adam. Ian Evatt takes the direct free kick. 64:32 Substitution Marlon Harewood on for Brett Ormerod. 64:14 Jonas Gutierrez crosses the ball, clearance made by Ian Evatt. 64:05 Jonas Gutierrez delivers the ball, Dekel Keinan manages to make a clearance. 63:04 Effort from 20 yards by Jonas Gutierrez. Blocked by Dekel Keinan. 61:49 Matthew Gilks takes the direct free kick. 61:49 Substitution Peter Lovenkrands comes on in place of Alan Smith. 61:49 Free kick awarded for an unfair challenge on Neal Eardley by Alan Smith. 61:23 Joey Barton has an effort at goal from 12 yards. Save by Matthew Gilks. 59:58 Dudley Campbell handles the ball and concedes a free kick. Free kick taken by Steve Harper. 59:23 Centre by Jonas Gutierrez. 58:17 Wayne Routledge fouled by Luke Varney, the ref awards a free kick. The free kick is swung in right-footed by Joey Barton. 57:47 The assistant referee flags for offside against Dudley Campbell. Mike Williamson takes the free kick. 55:43 Corner from right by-line taken by Joey Barton. 55:14 Corner taken by Joey Barton, clearance by Charlie Adam. 55:00 Centre by Jonas Gutierrez, comfortable save by Matthew Gilks. 54:39 Unfair challenge on Mike Williamson by Dudley Campbell results in a free kick. Joey Barton takes the direct free kick. 53:53 The ball is crossed by James Perch, clearance made by Dekel Keinan. 53:25 Luke Varney crosses the ball, save made by Steve Harper. 52:30 Luke Varney challenges Jonas Gutierrez unfairly and gives away a free kick. Free kick crossed by Joey Barton, clearance made by Brett Ormerod. 50:28 The referee blows for offside. Direct free kick taken by Steve Harper. 49:11 The official flags Luke Varney offside. Steve Harper restarts play with the free kick. 49:00 Centre by Neal Eardley. 46:32 Booking James Perch is cautioned by the ref for unsporting behaviour. 45:00+0:27 Free kick awarded for a foul by Ian Evatt on Andrew Carroll. Joey Barton takes the free kick. 45:00 It is the end of the first-half. Correction - 44:06 Luke Varney provided the assist for the goal. 44:06 Assist by Luke Varney. 44:06 GOAL - Charlie Adam:Newcastle 0 - 1 Blackpool Placed penalty scored by Charlie Adam. Newcastle 0-1 Blackpool. Correction - 43:14 Penalty awarded for a foul by Alan Smith on Luke Varney. 43:14 Alan Smith gives away a Penalty for an unfair challenge on Luke Varney. 41:47 Jonas Gutierrez concedes a free kick for a foul on Elliot Grandin. Elliot Grandin takes the free kick. 39:16 Free kick awarded for an unfair challenge on Joey Barton by Luke Varney. Steve Harper takes the free kick. 38:07 The official flags Kevin Nolan offside. Free kick taken by Matthew Gilks. 37:16 Luke Varney concedes a free kick for a foul on James Perch. Direct free kick taken by Steve Harper. 37:02 Andrew Carroll gives away a free kick for an unfair challenge on Dekel Keinan. Free kick taken by Matthew Gilks. 33:15 The ball is swung over by Andrew Carroll, Kevin Nolan concedes a free kick for a foul on Matthew Gilks. Matthew Gilks restarts play with the free kick. 32:49 Handball decision goes against Dudley Campbell. Alan Smith takes the free kick. 32:13 Corner taken by David Vaughan, clearance made by Mike Williamson. 31:54 The ball is sent over by Luke Varney, blocked by Mike Williamson. 31:31 Shot by Kevin Nolan. Save by Matthew Gilks. 30:56 The referee blows for offside. Steve Harper takes the direct free kick. 29:37 Free kick awarded for a foul by Dudley Campbell on Fabricio Coloccini. Direct free kick taken by Sanchez Jose Enrique. 29:03 The ball is delivered by Charlie Adam. 28:31 Joey Barton concedes a free kick for a foul on Dudley Campbell. Direct free kick taken by Charlie Adam. 28:13 The ball is delivered by Ian Evatt, save by Steve Harper. 26:30 Sanchez Jose Enrique takes a shot from 20 yards. Blocked by Neal Eardley. 26:07 The offside flag is raised against Brett Ormerod. Sanchez Jose Enrique takes the direct free kick. 24:40 Headed effort from inside the area by Mike Williamson hits the post. 24:02 Free kick taken by Joey Barton. 24:02 Booking Booking for David Vaughan. 23:56 David Vaughan gives away a free kick for an unfair challenge on Wayne Routledge. 22:06 Andrew Carroll concedes a free kick for a foul on Dekel Keinan. Direct free kick taken by Neal Eardley. 21:45 The referee blows for offside. Direct free kick taken by Steve Harper. 21:05 Jonas Gutierrez delivers the ball. 20:38 Wayne Routledge produces a cross, Neal Eardley manages to make a clearance. 17:55 Jonas Gutierrez crosses the ball, clearance made by Dekel Keinan. 16:47 A cross is delivered by Wayne Routledge. 16:21 Corner taken by Joey Barton, save by Matthew Gilks. 15:42 Free kick awarded for a foul by Neal Eardley on Jonas Gutierrez. Strike comes in from Joey Barton from the free kick, David Vaughan gets a block in. 14:45 Luke Varney concedes a free kick for a foul on James Perch. Steve Harper takes the direct free kick. 14:03 The offside flag is raised against Brett Ormerod. Steve Harper restarts play with the free kick. 13:56 The ball is swung over by Neal Eardley. 12:14 David Vaughan takes the inswinging corner, Header from close in by Ian Evatt misses to the left of the goal. 11:34 Dudley Campbell takes a shot. Save made by Steve Harper. Brett Ormerod takes a shot. Steve Harper makes a save. 10:45 The ball is crossed by Sanchez Jose Enrique, clearance made by Dekel Keinan. 8:53 Charlie Adam concedes a free kick for a foul on Jonas Gutierrez. The free kick is swung in right-footed by Joey Barton, save made by Matthew Gilks. 7:11 Dekel Keinan fouled by Kevin Nolan, the ref awards a free kick. Matthew Gilks restarts play with the free kick. 6:00 The assistant referee flags for offside against Elliot Grandin. Direct free kick taken by Steve Harper. 5:47 Neal Eardley produces a cross, Mike Williamson makes a clearance. 5:06 Alan Smith gives away a free kick for an unfair challenge on Elliot Grandin. Charlie Adam takes the direct free kick. 4:36 Kevin Nolan is caught offside. Matthew Gilks takes the free kick. 4:09 Elliot Grandin produces a drilled right-footed shot from 25 yards. Save made by Steve Harper. 3:41 The ball is delivered by Wayne Routledge, save by Matthew Gilks. 2:13 Free kick awarded for an unfair challenge on Andrew Carroll by Dekel Keinan. Joey Barton crosses the ball from the free kick right-footed from left channel, clearance by David Vaughan. 0:58 Shot by Dudley Campbell from deep inside the penalty area misses to the right of the target.